2 total results were found for this item. Ordered by high price to low price. 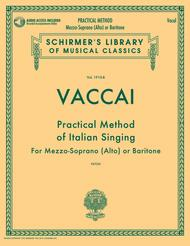 Practical Method of Italian Singing (Mezzo-Soprano (Alto) or Baritone, Book/CD). Composed by Nicola Vaccai (1790-1848). Edited by John Glen Paton. For Voice. Vocal Method. Softcover with CD. 48 pages. G. Schirmer #LIB1910-B. Published by G. Schirmer (HL.50498714).ISBN 1480328464. 8.5x11 inches.These famous methods are now available with a CD of piano accompaniments. In addition, the enhanced CD also includes tempo adjustment software for CD-ROM computer use. Practical Method of Italian Singing (Contralto/Bass). Composed by Nicola Vaccai (1790-1848). For Vocal. Vocal. Softcover. 36 pages. Ricordi #ER2997. Published by Ricordi (HL.50498726).The vocal methods of Nicola Vaccai (1790-1848) are well-known to classical singers and voice teachers around the world. 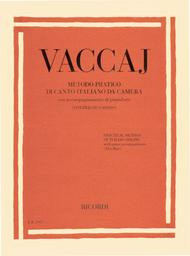 Ricordi was the original publisher of Vaccai.